You may be frustrated when you try to do push ups. I know especially for new boot campers it is quite frustrating. You always think like you should be able to do more, but the body doesn't quite seem to cooperate. My suggestion as in this video is to use a simple stability ball. This last weekend I had a little bit of "me time" so I spent some of it watching these films on Netflix. The first is Bigger, Stronger, Faster. One of my favorites for exposing the slimy markeitng that is done to convince us that we need supplements and pills to be happy and lean. If you'd like updates from me in your inbox, subscribe here. I didn't want to leave the eveing class without posting a video of them too. Thanks to my mentor, Todd Durkin, for passing this along. I've posted this minute long video of some of the evening boot campers laughing as they exercise. Yes it's true, you can have fun and burn fat at the same time. If you'd like to more video lessons, you can view them here. If you can't join us in person at our Pasadena/Altadena location, you can still get tips and ideas via our email newsletter. Thanks to Francesca Lucioni for passing along this video. Hat's off to Tim Ferriss for finding this one.. Most of you who are in the boot camp are here for fat loss and toning. Continuing with yesterday's theme of focusing on the basics, here are some more tips. If you "blow it" in one area such as not getting enough sleep, make sure that you do your best in the other two areas, eating clean, and training hard. If you falter in 2 or more areas, your chance of success is slim to none. Each Monday in May - My client, Onil Chibas of Elements Kitchen here in Pasadena, is donating 15% of proceeds when you eat at his restaurant to another great client of mine, Young and Healthy. Pretty simple. Eat on Mondays, get some incredible food, and everyone benefits. Here is my mentor, Todd Durkin of Fitness Quest 10 in San Diego going over the basics of succeeding at fat loss. You'll notice that we recommend the same things. There is a formula to success in getting leaner and losing the fat, please watch and get to it. This morning in boot camp class, one of my clients asked what she could do to reduce muscle soreness. I often recommend using the foam roller, but in this video, I suggest using the Tiger Tail too. It's smaller and quite often easier to hit the target...meaning those sore muscles. Have a look at the video, and give it a try. It's true, I've been in Denver, so it may take me a little while to get back to you. I am working hard behind the scenes. I speak about that, and the things to come in the video below. New clients, welcome to Boot Camp Pasadena. Like I mention in this short video, the first few classes are going to be challenging...and you are going to be sore. If you haven't exercised in a while, you are probably going to be quite sore. If you feel bewildered and overwhelmed, that is totally normal. Some of the other people in the boot camp have been with me close to two years, so they definitely know what they are doing. Soon you will too. I am here to help, and so are your fellow boot campers. I pride myself in creating a supportive group. We are in this together. The most important thing is that you have made the commitment, and you have the courage to show up...I totally admire you for this. Pat yourself on the back. There are many who talk about change, but fewer are those who actually do something. You are doing it! "It is not the critic who counts. or how the doer of the deeds might have done better. whose face is marred with sweat, dust, and blood. who lives and comes up short again and again. and spends himself in a worthy cause. and who, if he fails at least fails while daring greatly. So we've got a little friendly competition going on here at boot camp. On Monday night we did a fun little exercise with the BOSU ball. I actually had the pleasure to meet with David Weck, the creator of the BOSU ball late last year. He is super passionate about training, and a great guy to talk to about training. I won't divulge what the exact challenge is (you gotta train with us to experience it), but I can tell you that it will get your heart pumping and your legs pumped...and maybe burn some calories too. The point of this challenge is to see where you are at, and to push yourself. 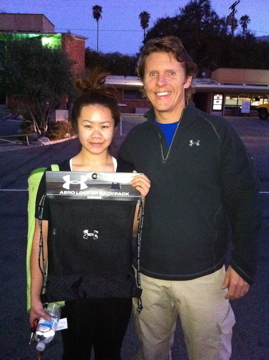 Our winner with the top number won herself a nice little Under Armour bag. The good thing is that when we do this challenge, the "winner" will be the one who improves the most. Keeping working hard. I know that there are still a few of you who need to compete in this challenge, but so far our winner is Laura T. of the morning class. She really kicked a.. . The ladies were super tough! Here she is with her prize. Laura wins the BOSU ChallengeFor those of you who competed but didn't quite get there...you still got a nice prize, right? (That prize was 15% at my buddy Onil's restaurant, Elements in Pasadena.) If you haven't eaten there yet, do yourself a favor and bring your loved ones for an incredible experience. Today is their 1 year anniversary too! Speaking of Onil...look who got caught on video doing the BOSU Challenge.